Supreme Court's New Judges: who will make it to Collegium's shortlist? As the new CJI takes over on December 2, the Constitution Bench is understandably anxious to complete its reform of the Collegium by laying down guidelines at the earliest. The case for early completion of the consequential hearing on Collegium is that the next Collegium can begin its meetings immediately after the next CJI takes over, in order to fill six vacancies in the Supreme Court [three current + three immediate future], and 408 vacancies in the High Court, which will further increase in the coming months, if the existing ones are not filled immediately. This article speculates on the probable names who could be in the consideration zone for filling the vacancies in the Supreme Court, as per the present informal critieria followed by the Collegium, even though the guidelines to be framed by the Constitution Bench are likely to modify them. Currently, the appointments to the Supreme Court are governed by all-India seniority of High Court chief justices, and the possibility of the fresh appointees having a tenure of at least three plus years in the Supreme Court. There are currently three vacancies in the Supreme Court. With Chief Justice HL Dattu and Justice Vikramajit Sen retiring in December, the number will go up to 5. As Justice M Yusuf Eqbal is retiring in February next year, his replacement has to be selected in advance. Therefore, the Collegium has to select six Judges for appointment to the Supreme Court. If you look at the all-India seniority among High court chief justices, the Chief Justice of the Allahabad High Court, Dr.D.Y.Chandrachud, whose date of initial appointment as Judge is March 29, 2000, is likely to a strong contender. As his current date of retirement (at age 62) is 10 November 2021, his date of retirement as a Supreme Court Judge, if appointed, would be 10 November 2024, as Supreme Court Judges retire at the age of 65. If appointed, he will have a long tenure of almost nine years, which is unprecedented even for the current Judges. Among the current Judges, only Justices Bobde and NV Ramana have around eight years of tenure in the Supreme Court, if you consider their dates of appointment and retirement. The Chief Justice of Calcutta High Court, Smt. Manjula Chellur, is one month senior to Justice Chandrachud in all-India seniority on the basis of date of initial appointment as a Judge of the High Court. But as her date of retirement as the High Court judge is 4 December 2017, she will have a short tenure of just 4 years as the Supreme Court Judge. The Orissa High Court Chief Justice D.H.Waghela, with his initial date of appointment as 17 September 1999 and the Chief Justice of Manipur High Court, Justice LK Mohapatra, whose date of appointment as Judge is 16 September 1999 are other two contenders on the basis of seniority. If appointed to the Supreme Court, Justice Waghela would retire on 10 August 2019, and Justice Mohapatra would retire on 9 June 2019, that is , each of them would have more than the minimum tenure of 3 years. The Chief Justice of Madhya Pradesh High Court, Justice AM Khanwilkar, with his date of initial appointment as a Judge as 29 March 2000, will be another contender, as his date of retirement as a Supreme Court Judge would be 29 July 2022. The Kerala High Court Chief Justice, Ashok Bhushan, with his date of initial appointment as 24 April 2001, and the Madras High Court Chief Justice, Sanjay Kishan Kaul, with date of initial appointment as 3 May 2001 would be the remaining contenders. Of them, Justice Bhushan would retire on 4 July 2021 and Justice Kaul would retire on 25 December 2023, if appointed to the Supreme Court. Region-wise, Justices Chandrachud, and Khanwilkar, have Bombay as their parent High Court. Justice Manjula Chellur and Justice Kaul are from Karnataka and Delhi High Courts respectively. 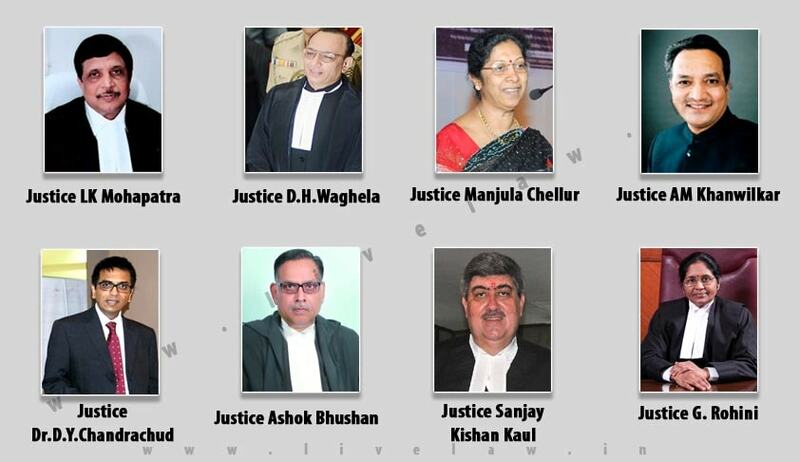 Justice Mohapatra’s parent High Court is Orissa while Justice Ashok Bhushan is from Allahabad. Justice Waghela is from Gujarat. If any of them failing to make it to the final list, the Chief Justice of the Delhi High Court, Justice Smt Gorla Rohini with Andhra Pradesh as the parent High Court, and with 25 June 2001 as the date of initial appointment, may find herself in the zone of consideration, as her date of retirement as the Supreme Court judge, if appointed, would be 13 April 2020. The chief justice of Meghalaya High Court, Justice Uma Nath Singh, with his initial date of appointment as 22 October 2001, and with Madhya Pradesh as the parent High Court, may also find himself in the zone of consideration, as he would retire as the Supreme Court Judge, if appointed, on 14 January 2019. Of the current 28 Supreme Court Judges, the region-wise break-up is as follows: Delhi: 4, Tamil Nadu: 3, Punjab and Haryana, Maharashtra, Madhya Pradesh, Karnataka, Andhra Pradesh, North-eastern States, and Uttar Pradesh: 2 each, Bihar, Jharkhand, J&K, Gujrat, Orissa, West Bengal, and Kerala: 1 each. The three retiring Judges hail from Karnataka (Justice Dattu), Delhi (Justice Vikramajit Sen) and Jharkhand (Justice Eqbal), respectively. Considering the regional break-up after their exit, it is expected that Justices Chandrachud, Manjula Chellur, Sanjay Kishan Kaul, Waghela, Ashok Bhushan, and Mohapatra, may well be considered for elevation to the Supreme Court by the Collegium. The question how the judges’ outstanding merit will be considered by the Collegium for elevation to the Supreme Court would merit another article.